Hood Tech Vision designs, builds, and sells stabilized turrets that incorporate electro-optical cameras, infrared imagers, laser markers and designators, and many other sensor payloads. Hood Tech Vision™ imaging systems offer sophisticated capabilities developed to address a full range of military and civilian needs. The systems can accurately lock onto a target and carefully observe it while mounted to a constantly moving, high performance platform. The system compensates for vibration and other interfering factors that contribute to image deterioration. This provides the ability to conduct sustained observation of moving or stationary objects of interest, without missing potentially vital information. Hood Tech Vision’s turnkey systems require a minimum of training. A simple joystick control can operate the system from a remote ground station in most models. An operator can quickly learn to smoothly pan and tilt the camera for wide-area searches or remain locked onto an object as the carrying platform – an aircraft, boat or vehicle – is being maneuvered. Sophisticated focus and image enhancement mechanisms ensure that the operator is getting the best image possible in any situation. With both daylight and thermal cameras operating with continuous zoom, Hood Tech Vision's day/night payloads can lock the zoom angle together to provide simultaneous and matching views. 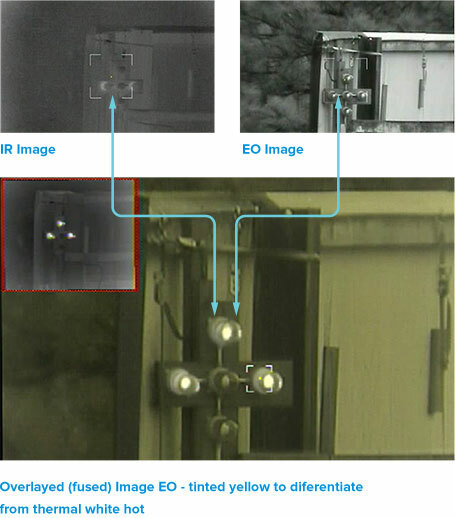 With this ability, Hood Tech Vision is able to then highlight the daylight image with a yellow (or other) tint to illustrate on the overlaid daylight and thermal image which elements are being contributed by the daylight camera and which are coming from the thermal camera (white). With both images aligned and overlaid, information about the scene in question can be obtained that will yield more intelligence and lead to more successful operations.